I have a bed of Meidiland landscape roses that are about 8 years old. The canes have gone wild and become entangled, and they have considerable blackspot. The bushes don\'t bloom as profusely as they did a few years ago. I would like to cut the canes back to within several inches of the crowns, get out all the dead wood and leaf debris, make sure the soaker hose is working, and lay down new mulch. Can I do this in the fall or is it best to wait until spring? 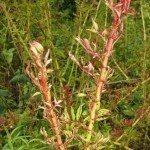 It is best to rejuvenate a rose in late winter before leaf buds break. If you watch closely, you will see the buds starting to swell. Read the general rules for pruning roses if you aren't familiar with them. After pruning, improve the soil with compost and fertilize lightly. (also fertilize on Memorial Day and July 4th and a light (50%) fertilization on Labor Day if you live in a mild climate) Work both into the top 2 inches of soil then mulch. Make sure at least 6 hours of direct sunlight is still getting to the roses. I know it is written that landscape roses don't need annual pruning; however, take out dead, diseased and crossing branches every year. (black spot can infest the canes) Check for frost heaving and give firm pressure around the base of the rose if you notice any.